The billboard campaign is the latest in Heartland’s continuing battle against the scientific evidence of climate change. Heartland has also sponsored and organized six conferences on climate denial in the past 5 years, and they recently held a seventh that took place May 21-23 in Chicago. The “International Conferences on Climate Change,” as Heartland calls them, provide a platform and meeting space for the small cadre of professional climate science deniers that have derailed meaningful solutions to the threats of global warming in the U.S.
Because of their outrageous attacks on climate science, 15 corporations have dropped the Heartland Institute. Send Nucor's CEO Dan Dimicco an email telling him to stop funding the Heartland Institute and climate denial. The truth is, if Heartland’s deceptive and dishonest talk about climate science was aimed at the few aging contrarians that attended the latest meeting, it wouldn’t be that big of a deal. However, Heartland doesn’t get paid by Nucor and other big carbon emitting corporations to mislead a fringe tribe of retired old white men (picture of conference at right). Heartland gets paid to derail solutions to climate change. This has meant creating anti-science curriculum for grade schools, paying spokespeople to deny climate science, and attacking the scientists that do real work on climate change. Given that the $500,000 Nucor has given Heartland in the last 3 years was specifically for attacking climate science and environmental regulations, Nucor must be held accountable for Heartland's climate science denial. Send Nucor CEO Dan Dimicco an email telling him to stop funding attacks on climate science and the Heartland Institute. For updates on the Heartland Institute, see PolluterWatch's ongoing investigation. In a recent study, scientists found that climate change will decrease the number of seasonal flowers, leading to an overall decrease in the number of butterflies, who rely on flowers for a sustainable source of energy - no destruction required. Another recent study found that climate change will increase the number of Lyme disease infected ticks, parasites that drill into their prey and extract their blood, leaving sickness and suffering in their wake. Speaking of bothersome pests - Senator James Inhofe, staunch global warming denier and human prune, went on the Rachel Maddow Show to discuss his new book, "The Greatest Hoax: How the Global Warming Conspiracy Threatens Your Future." During the interview, the good Senator from Oklahoma repeated his belief that a global conspiracy of environmentalists and scientists (and global temperature readings) are colluding to create the illusion of a changing climate, just to justify taxes. Though Inhofe has said ludicrous things about climate science many times before, he rarely mentions why he initially became such a zealous climate denier. So, if Inhofe lets money dictate his policies, what does it mean that the top three contributors to his campaign are dirty energy companies (Koch industries being #1), or that he has taken well over $1 million from the fossil fuel industry since 1999? Come on Inhofe, dont be such a tick. Some journalists have issues with reality. Here at PolluterWatch, it's obvious when agents of the climate denial machine succeed in taking advantage of widespread scientific ignorance in our country and place stories in the news that misinform the public on global warming. While many have come to expect unscientific coverage of global warming on agenda-driven partisan fronts like Fox News, poor reporting pervades plenty of more respected sources of news. Some recent revelations about the Heartland Institute have led me to correct my earlier statement about global warming. It now seems that the jury is in and has rendered a verdict: The Earth is becoming warmer, caused by the amount of gases that humans are sending into the upper atmosphere. While we wish this had been clearer to Mr. Midkiff years ago (NASA's James Hanson told Congress this was a pressing global issue with a formidable human impact way back in 1988), his revelation and willingness to publicly explain it is a small win for both science and journalism. Even earlier this year Mr. Midkiff had been questioning aspects of climate research that the scientific community can easily dismiss with their tedious work. 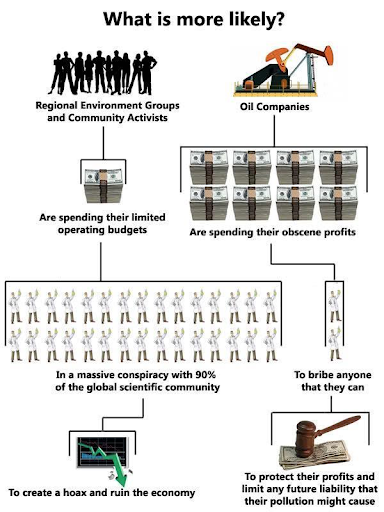 Well-organized and -financed public relations shops like the Heartland Institute and many others (check out ExxonSecrets and DeSmogBlog) play a critical role in the effort to fabricate public doubt, politicizing the science of climate change by demanding journalists cover their "side" of the story, even though it carries no scientific relevance. Worse yet, they are expert projectionists, taking their very tactics of lying, misrepresenting, cherry-picking, bullying and politicizing and blaming their opponents for those very things. It's like arguing with a child: "I know you are, but what am I?!" And horrifyingly, it works and has worked for decades now, which is why the booming public relations industry in this country dwarfs the presence of true journalists whose job it is, ideally, to dig up an accurate story and present it to the public for final judgement. The Heartland Institute is a hired PR gun in this case, taking money from a few rich ideolgues and vested interests and packaging doubt over global warming to sell to the media and American people. Luckily, we can see that the lastest exposure of Heartland's climate denial campaigns through their leaked internal documents is shining a light on this shadowy effort to deceive us all. May that trend continue as Greenpeace continues to investigate the Heartland Institute.